An atmosphere of elegant dining prevails, complimented by the daily activities taking place around the watering hole, approximately 60 meters away. The surrounding nature lends itself to long lazy afternoons, spent relaxing on the sofas in the lounge, watching the animals go. And when things heat up, all that is required is a gentle stroll to the rim flow pool. Sit and relax in the flowing waters while enjoying an ice cold cooler. Alternatively if more strenuous activity is required, then relaxing on your patio and reading a good book should provide you with all the exercise you may need. Unfortunately no children under the age of 12 permitted. The Onguma Tented Camp is unfenced and therefore no children under the age of 12 years will be allowed. Children 12 and above stay in their own room at full price. We just returned from Namibia. Unfortunately, we only stayed here one night and stayed at Ongava Lodge for 2 nights. 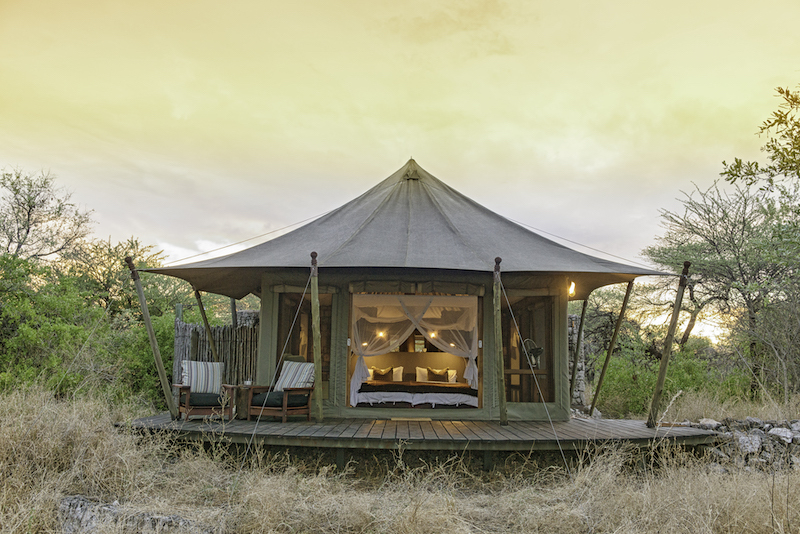 Onguma Tented Camp is an absolute must. Perfect location, friendly staff, absolutely stunning tents situated around a great waterhole that was directly in from of our tent. We awoke to a herd of zebra. Wonderful. The “tents” are ultra luxurious and the lodge feels like home. Onguma has done a wonderful job at mixing a traditional african tent setting with a clean, modern feel. The staff pays great attention to detail and ensures your visit is perfection. My boyfriend and I rated this our favorite place during our 2 weeks vacation in Namibia as we stayed at some very nice places. We both said in hindsight we would have stayed here 2+ nights. HIGHLY RECOMMENDED!